China has allowed the value of its yuan currency to weaken against the dollar for a third consecutive day. The central bank on Thursday set the yuan's daily reference point just over 1 percent lower from the previous day, at about 6.40 per dollar. Beijing strictly controls the yuan, allowing it to trade within a range of 2 percent above or below the reference point, which it sets daily. So far, the currency has lost around four percent since the initial change in the market midpoint. Central bank officials on Thursday attempted to ease fears of further devaluation, saying the yuan was now close to "market level." "The adjustment to close the gap between central parity rate and actual trading rate of Chinese currency... has basically completed," said an official at the People's Bank of China, according to the Xinhua news agency. Trading was mixed Thursday across Asia following the central bank's comments. The initial Chinese move had prompted two days of decline in major world stock markets. Many investors are worried the intervention signals growth in the world's second-largest economy is slowing more than originally thought. There are also concerns it could prompt other nations to devalue their currency, since a weaker yuan makes Chinese exports more competitive for foreign buyers. Vietnam on Wednesday did just that. Under the new rules, Vietnam's currency, the dong, can be traded within two percent above or below the daily reference point. The previous rules allowed trading within 1 percent. "As China is Vietnam's largest trading partner, an adjustment of Chinese currency will have a negative impact on Vietnam's economy," said the State Bank of Vietnam. An editorial Thursday in China's state-run Global Times said it was "absurd" to hype the threat of a yuan devaluation, saying there is "hardly" a currency war. "Since the yuan exchange rate is determined by the market, there are bound to be possible fluctuations in both directions - revaluation and devaluation. And it would be abnormal if it only goes, up," the editorial said. The Chinese central bank had allowed little movement against the dollar since the 2008 global crisis. That pushed up the yuan as the dollar rose over the past year, hurting Chinese exporters as other developing country currencies fell. 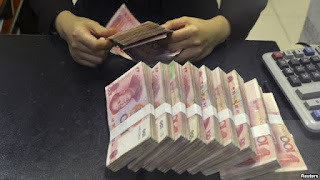 The central bank said it acted because the Chinese currency was rising while market forces said it should fall. The move toward more flexibility at a time when market pressures were set to push the yuan down left Washington and other trading partners that have criticized Beijing's currency controls off balance. They have urged China for years to switch to a market-based system but assumed that would cause the yuan to rise and help their own exporters. That leaves the U.S. government in an “awkward and difficult” position, said Eswar Prasad, a professor of trade policy at Cornell University. “A falling yuan and a rising bilateral U.S. trade deficit with China will sharpen congressional criticism of China's currency policies,” he said. Financial analysts say the yuan could be overvalued by up to 10 percent. That would mean allowing market forces free rein might push it down even further. For automakers and other global companies that increasingly rely on sales to China, that could erode revenues as they are brought home and converted into foreign currency. Already this year, Volkswagen and Hyundai have reported profit declines due to weaker Chinese sales. With many automakers reporting declines in July sales, such losses could be magnified by further weakening of the yuan. Some Chinese exporters suspended signing contracts in foreign currencies, according to news reports. The general manager for Japan sales of Anhui Garments Import & Export Co. said the company was waiting for exchange rates to stabilize, the newspaper China Business News reported. “Right now we are not optimistic,” the manager, Meng Zhuo, was quoted as saying. China's Asian neighbors face a potentially wrenching transition as they cope with the two-pronged threat of more competition from its exports and weaker Chinese demand for their goods. “The economies of Hong Kong, Taiwan, Korea, Malaysia and Thailand look exposed,” said Credit Suisse analysts Santitarn Sathirathai and Michael Wan in a report. Manufacturers of computer disk drives have shifted some operations from Thailand to China and that outflow could accelerate if a weaker yuan reduces Chinese operating costs, according to Sathirathai and Wan. Many economists saw Beijing's policy change an effort to unload a glut of excess supplies in Chinese industries from steel to solar panel manufacturing that have led to price-cutting wars and threatened the financial health of manufacturers.